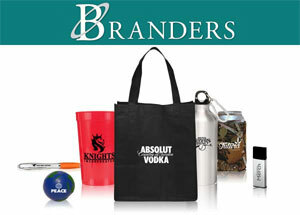 Branders is the trusted go-to source when it comes to promotional items. With 100% customer satisfaction rate we cater to both small and large businesses, as well as individuals looking to personalize our unique items in order to promote their services or special events. We have a wide range of promotional products, so you won't have to look anywhere else, and to make sure that we deliver exactly what customers want every time, we train only the best team to provide you with excellent service. We source our items from the same suppliers as do other reputable e-commerce companies, but because our operation costs are lower, our products also have lower prices. In short, we pass our savings on to you. At Branders we pride ourselves on efficiency, but we also like to keep it very personal. That's why we have friendly sales representatives on standby who are ready to take care of all your concerns, from placing your order, to personalizing your products, to getting them delivered in time for your event. This way we don't just perform, we form partnerships that last a lifetime. So if you want to get in touch with us simply dial (844) 806-1306, toll free. We hope to hear from you soon!